A friend of mine loaned me his copy of this book because we share similar tastes in reading and I must say I found it well-written and compelling. Galactic North is a collection of eight short stories all set in the same “universe” and spanning centuries. Interestingly enough, in addition to realistically portrayed interstellar travel, suspended animation, and human cybernetic hive minds, he focuses quite a bit on the medical adaptations to human beings, from the hyper-cerebral Conjoiners, to the terrifying Denizens. The only thing that put me off a bit were the instances of what I call “medical atrocities,” that is, how some of the people in the stories end up horribly altered and mutilated, but that’s more a problem with my squeamishness than Reynolds’ writing. 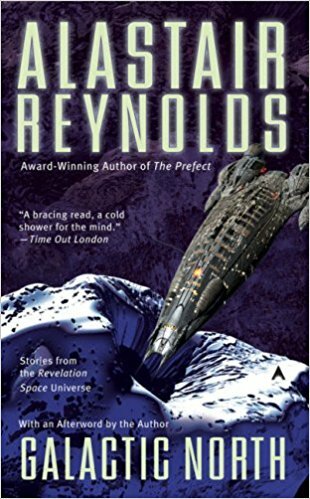 As I understand it, Reynolds has written a number of other short stories and novels in the “Revelation Space” series, comparable to Larry Niven’s “Known Space” series. I have no problem giving “Galactic North” a solid five stars on Amazon, which I will be doing in just a bit.